From 1943 to 1950, motorists cruising out in the Mojave Desert down what is now California State Route 58 were often shocked to see a 650 foot long Imperial Japanese Navy Takao class cruiser sailing along the sands of the desert, complete with the Rising Sun flag on one of the masts. With sand packed against the ship like ocean waves and the sun beaming across the desert creating a ripple effect from the heat distortion, the ship appeared to be sailing through the desert. Back then the area was known as Muroc. A very small community had sprung up starting in 1910 with the arrival of the Corum family. They couldn't name the area Corum, California because one already existed, so they reversed their last name and called the area Muroc. Located near the Rogers Dry Lake, the local population grew to a mighty 44 people by September 1933. 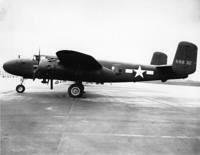 Around that time the Army Air Corps showed up and Muroc Bombing and Gunnery Range was established. The Muroc Bombing and Gunnery Range was a remote training site that specialized in bombers dropping their payloads out in the empty desert. But when Pearl Harbor happened and the United States entered World War II, the base became a permanent location and was devoted to the training of combat flight crews. Where as before there were no permanent structures, now hangars and other buildings were erected in the desert. 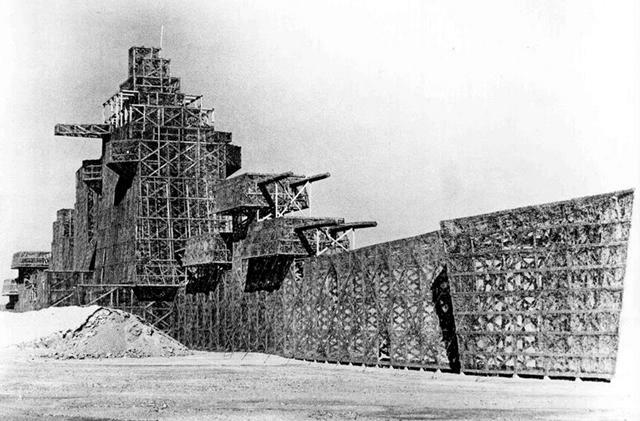 And one of those structures was the Muroc Maru. Coming in at $35,819.18, the Muroc Maru was a replica of a Japanese Navy Cruiser. Officially it was called "T-799 Japanese Battleship, Plan No 944/41 W-509-Eng 4239". It was 650 feet long and built out of 4x4s and chicken wire. Tar paper and chicken feathers covered the structure. 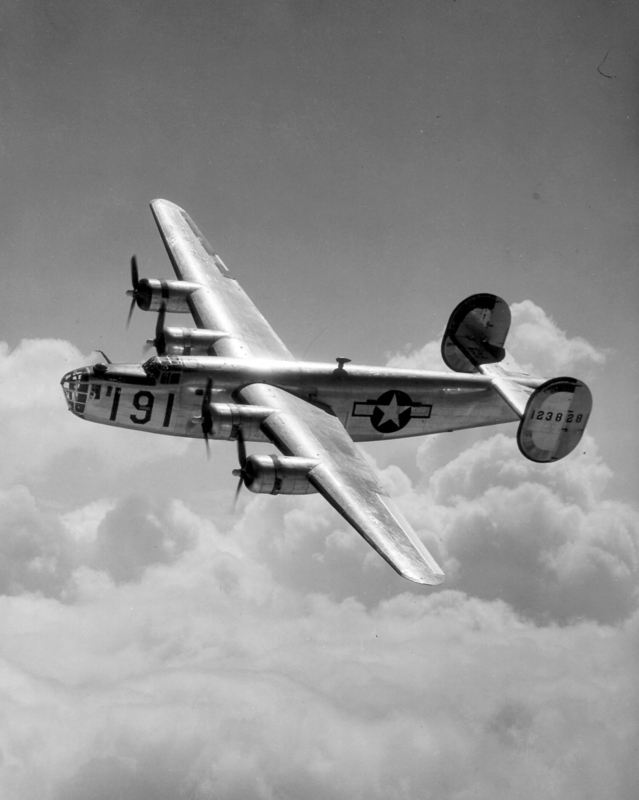 It had multiple uses for the base ranging from target and bombing practice, strafing practice, and identification training. With the sand packed around the ship like waves and the heat waves causing the desert floor to ripple and shimmer like an ocean, the ship certainly gave the mirage like effect that it was sailing on actual waters. Until 1950, the Muroc Maru was bombed and shot at. 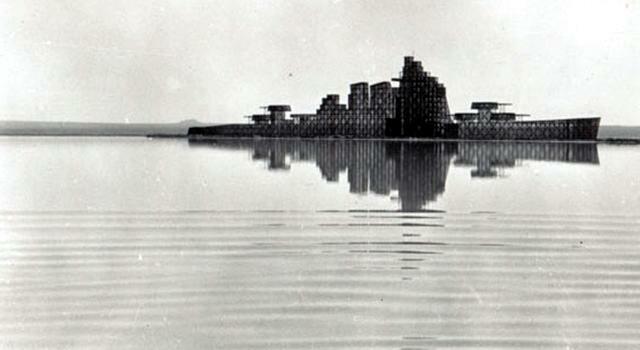 For some reason in 1950, the structure was declared a "flight hazard". No I don't know how a ship sailing the desert can be a "flight hazard". 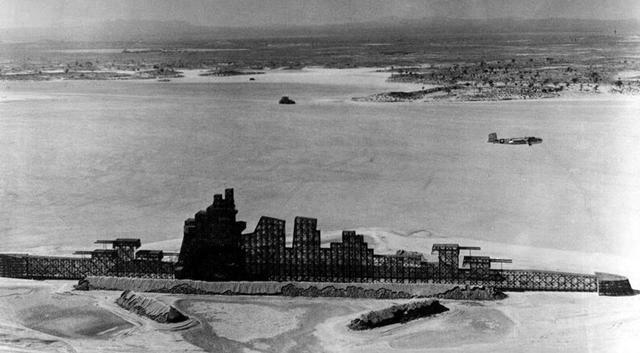 Army engineers were sent in to dismantle the ship, which turned out to be an extremely difficult chore with all the unexploded bombs in the belly of the ship. 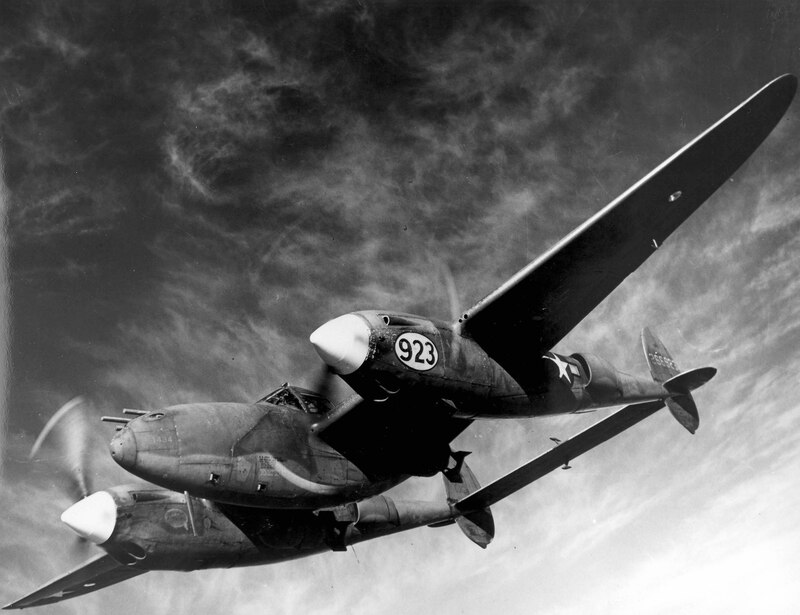 A sampling of just some of the planes that were flown and tested on Muroc Air Force Base around World War II include the B-25 Mitchell, P-38 Lightning, Maxwell B-24, and the XP 80A Gray Ghost. Other significant moments in the Muroc Bombing and Gunnery Range History include September 1942 which celebrated the arrival of America's first jet. 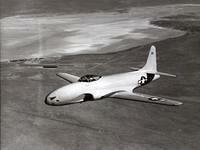 The XP-59A took its first flight on October 1st. While it was on the base it was disguised with a wooden propeller in order to hide the fact that it had jet propulsion. 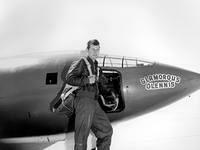 October 14th, 1947 saw Captain Charles E. Yeager become the first man to break the sound barrier as he flew the Bell X-1 experimental rocket plane. In February 1948, the area was finally designated Muroc Air Force Base and in honor of Captain Glen W. Edwards, the base was renamed in February 1949 to Edwards Air Force Base. The town of Muroc is long gone now with the post office closing in 1951. The area where the town was is now located on Edwards Air Force Base.